Honest Abe Living’s August/September issue features an inspiring new timber frame home custom designed, manufactured and built by Honest Abe. You’ll see photos, read the owner’s story and review the floor plan. 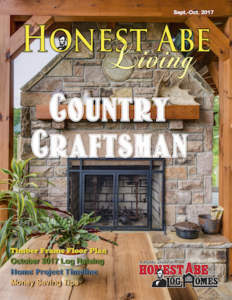 Also in this issue are tips from a customer who has built and lived in two Honest Abe log homes. See the schedule for 2018’s log raisings, and learn more about the Oct. 14 log raising that’s the last planned for 2017. Your mouth will water at the recipe for Wiener Schnitzel from Lodge Cast Iron.